Scosche has announced that it has launched a new portable wireless speaker for people who want to listen to their favorite music on the go without headphones. 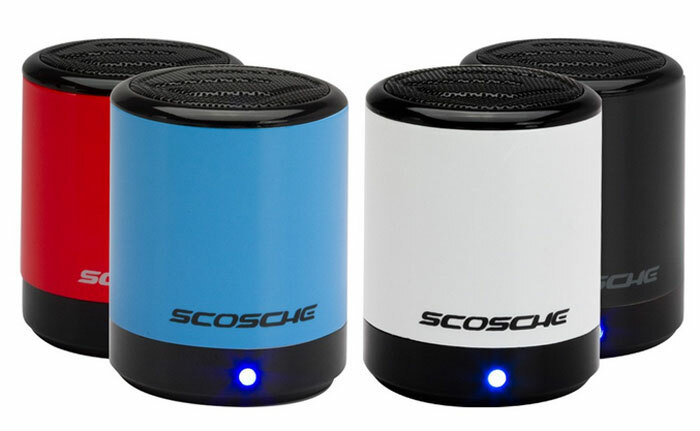 The speaker is called the Scosche boomCAN BT and it is available now for $29.99. The speaker comes in four different colors including red, blue, white, and black. The speaker has a wireless range of 30-feet and an internal battery good for two hours of playback per charge. The travel pouch the speaker stores in has a USB cable or charging and an audio cable for connectivity. The driver inside the wireless speaker is a 35mm unit that is good for music and spoken content. The speaker fires upwards and produces a 360-degree sound stage. The boomCAN BT is very small at less than 2.5″ tall and 2″ wide. That makes it very portable and easy to fit in a crowded purse or backpack. The speaker has an aluminum housing that is strong and light. An auxiliary port is built-in for devices that don’t have Bluetooth capability. The speaker will work with any mobile device that supports Bluetooth. The device will work with the BikeMount so it can be attached to a bike for listening on the road.